prudsys AG and the Chemnitz University of Technology have jointly developed a new maturity model. The “prudsys personalization index” measures the quality and completeness of retail companies’ customer orientation. The quality of personalization is measured by three factors: professionalism, organization and technology. It allows retailers to uncover important sales potential and strengthen customer loyalty. prudsys AG is the market and technology leader in real-time personalization in retail. The Chemnitz-based software manufacturer has developed the prudsys personalization index over the last six months. It consists of a maturity model to help retailers assess the quality of their customer orientation. Since its foundation in 1998, the company has supported retailers in their efforts to adapt to growing customer demands in the age of digital transformation. “Customers today want access to any product at any time, anywhere and preferably at the lowest possible price. At the same time they want retailers to recognize their trust and to be respected for their uniqueness. Nowadays, a personalized customer approach across all channels is a must”, says Andreas Schmidt, Head of Marketing at prudsys AG. The prudsys personalization index provides answers to questions like: Is my company equipped for business in the future? How good are my personalization measures? What more can I do to promote my company in this respect? To maintain both objectivity and scientific standards, prudsys AG secured the cooperation of the Chemnitz University of Technology. A team from the Faculty of Business Informatics II (Lehrstuhl für Wirtschaftsinformatik II) under the direction of Prof. Dr. Peter Gluchowski worked intensively on the development of the maturity model. Based on the three dimensions of professionalism, organization and technology, the model surveys the quality of the personalization measures employed by retail companies. “What was important to us here was the scientifically sound delineation of the individual dimensions. 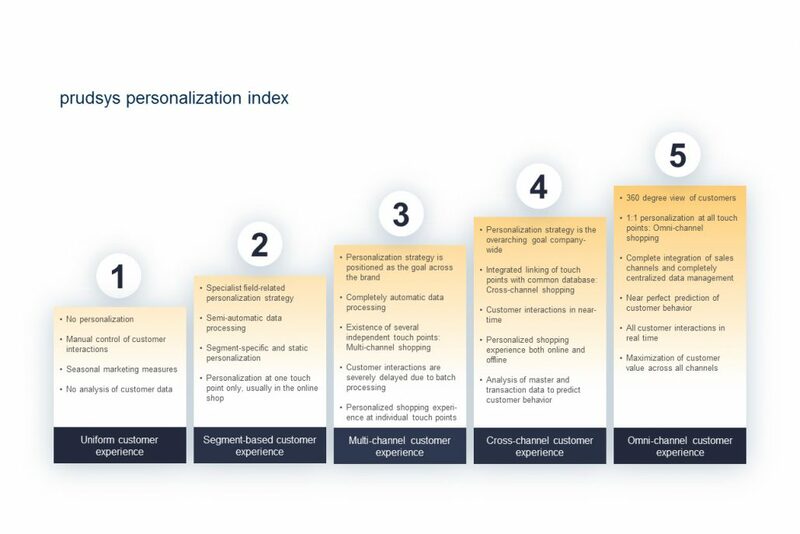 This breakdown makes it easy for retailers to identify which of their personalization activities still require optimization”, explains Prof. Dr. Gluchowski, Chemnitz University of Technology. A question catalog containing 44 questions, each with five possible answers, forms the basis of the prudsys personalization index. As not all of the aspects are equally important, weighting factors based on expert interviews were determined to represent the relevance of the individual categories from a technical point of view. A formula was developed on this basis which is then used to calculate the index. The index has 5 levels and represents the company’s level of maturity. Retailers classified as Level 1 offer all customers the same shopping experience. This level does not yet feature any personalization. At Level 5 retailers have a 360 degree view of their customers and are in a position to personalize all customer interactions across all channels in real time.